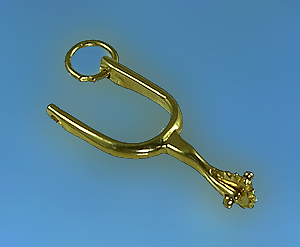 Spur charm, great for any style charm bracelet. The Gorgeous Horse offers only the best in equestrian jewelry. Fully functional spur charm. Perfect for any collector. Looks great on any style charm bracelet. Dimensions: 3/8 inch wide x 7/8 inches tall. PICTURED AND PRICED IN 14KT YELLOW GOLD.